However, despite our tiredness, the views up the mountain were incredible (see photos). George began to tell us the history of the tribes living on the mountain. Apparently, the two tribes had been enemies for a long time, which explained the village names, which translate from Swahili into “Attack” and “Wait.” The village at the top of the mountain (“Wait”) had to get supplies from the bottom of the mountain, but they couldn’t because every time they tried to, the village at the bottom of the mountain (“Attack”) would attack them, because they were enemies. The villagers were very nice, and we all got to practice some of our Swahili, saying “Poa” in response to “Mambo” and greeting adults with “Shikamoo” as they passed (thanks to Nasra for helping all of us with our Swahili!). After what seemed like ten “Only one more big hill’’s from George, we made it to the waterfall! The SEGA girls used their kangas as swimwear (yet another use of a kanga) and MEGA girls wore their swimsuits. For some, just dipping their feet into the freezing water was enough to cool off. For others, the waterfall itself was the only way. Everyone had a great time seeing how long they could stand under the heavy and extremely cold water running off the mountain, and Zunna, we noticed, was in the water the entire time (how???)! A villager passed by and was selling some of his paintings, and many MEGA girls took advantage of the opportunity. George helped us all bargain, and we ended up getting great prices and beautiful paintings to take home. After lots of photos and some bread as a snack, we headed back down the hill. Everyone was so tired that they were falling asleep on the bus ride back! After lunch, everyone met up again to continue crafting. Along with friendship bracelets, we made beaded bracelets, colored coloring books, and some made origami and cards out of colored paper. There was a comfortable silence, as everyone was exhausted from the hike and was content to listen to the playlist Lissy had made. 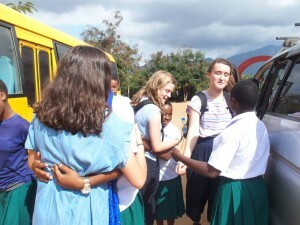 Dana came to check up on us, and encouraged the SEGA girls to show us some traditional Tanzanian dances. Nasra, Zunna, Sarafina, and Esther sang and danced to a song, while Maria translated its meaning, which was a warning from a mother to a daughter to do well in school and avoid alcohol and drugs. Then, it was the MEGA girls’ turn. Lissy led everyone in the Cotton Eyed Joe, which caught on quickly. We were all embarrassed at first, but it was a common feeling in the group when it came to dancing. Once we all began, however, it was very fun. It was many people’s favorite memory of the trip. Neptune, one of the dogs at SEGA, even entered the dance, running between the line-dancing legs of MEGA and SEGA girls. SEGA girls decided to show the dance at the next morning assembly once school started up again. After taking some photos with our newly decorated banner, everyone went to dinner. After dinner, it was time for a spa and movie night! The MEGA girls brought out face masks and scented hand lotion, as well as the chocolate covered dates from Abu Dhabi. 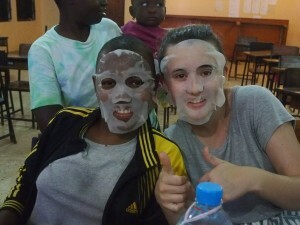 The face masks were very refreshing, but very scary looking (see photo). While we all put on our face masks, Dana helped us by setting up High School Musical on the projector. The MEGA girls showed off by singing along to all of the songs, and there was a heated debate between everyone over which character was the best (many girls had seen the third one already, but we were watching the first one). When there was a problem with the projector, Rehema, Zunna, and I walked to the visitor’s lodge to get Dana to come help – with our face masks on, which must have been a little startling for Dana! Maria was helping take care of the matron’s children, and demonstrated yet another use of the kanga, that we had already seen once from our bus but not up close – she tied the kanga around her back and put the baby in the fabric. It must have been very comfortable – the baby fell asleep right away, despite the very loud High School Musical soundtrack in the background. The next morning, it was time to say goodbye. There were many hugs, friendship bracelet and card exchanges, and promises to write each other. It was surprisingly difficult to say goodbye. Although we had only stayed for 2.75 days, we had packed a lot of activities and excitement into these days, and had grown close. 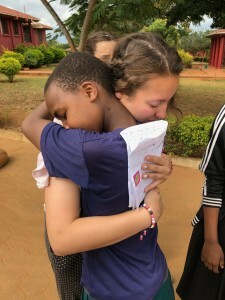 Through all of our experiences at the school, with the girls, and in Tanzania, one thing became very clear: it matters not where you are from, but who you are. Whether you live in Madison or Morogoro, the human experience is still the same. We all feel tired, or shy, or nervous, or excited, or sad. How you grew up or how you live now does not matter in that respect. We are all human, and nothing can change that. I think I speak for all MEGA girls when I say this experience was wonderful, and we will continue to treasure and remember these friendships made at SEGA. We would like to thank the entire SEGA staff, especially Isabella, Rhona, and Dana, as well as our incredible chaperones, Faith Hoenecke (we <3 you, Profe) and Anne Pringle (coolest mom around) for making this trip a reality. MEGA for SEGA now has the real-life interactions with SEGA girls that will strengthen our club and our sister school status with the SEGA Girls’ School, as we will all have a renewed interest in continuing our relationships with these girls. We will continue to share and celebrate the similarities and differences in our everyday lives, and I am sure that the values we have in common will take both MEGA and SEGA girls far. Just as this trip was a dream that became a reality, dreams that we have now will become realities with hard work, patience, and kindness, qualities that the SEGA Girls have reminded us to always value above all else.